There are a few benefits in going with a summer wedding idea. First, there is a better chance that the weather will be nice than other times of the year. Second, you have more options for wedding locations, including tented weddings and other outdoor venues. Lastly, it will be easier for out of town guests that need to travel to attend your wedding. The first thing to check off of your list when selecting a summer wedding idea is air conditioning if your wedding reception will be indoors. The last thing you want to happen is for guests to be uncomfortable and sweating at your wedding. Tented weddings are a little different, but rental companies should be able to provide fans and air conditioning. This one is perfect for the bride and groom that are in love with New York City. However, this same concept could be carried out for any large city. Although this theme idea could be executed in any season, we think it fits best as a late summer wedding idea. Instead of numbering the tables at the reception, name each table a section of New York City. Examples include SOHO, East Village, Upper East Side, etc. 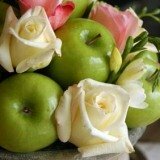 On the tables, have bowls of green or red apples as your centerpieces. For seating cards, take an apple and tie a paper leaf to it that has your guests name and table on it. Add an Apple martini as a signature drink at the reception. Find small figures or ornaments of New York City landmarks to give away as favors. Many invitation designers offer New York City designs. This is a fun wedding theme and one of the most unique that we have seen. A tented affair is the perfect location for a circus wedding. Hire a fire-eater and stilt walker to create a circus atmosphere. An upscale clown might also be an option for entertaining the kids (and select adults) in attendance. Build or rent booths for games like ring toss, balloon darts and other games you would typically see at a circus or carnival. Rent a popcorn or cotton candy machine. Have old fashioned cigarette girls dress up and walk around giving out candy cigarettes and chocolate cigars (or the real thing if you have a smoking crowd) along with other novelty candy. Instead of or in addition to the typical wedding cake, serve small, retro novelty desserts. Find a rental company that has an old photo booth, like the ones you sat in as a kid at the mall. Have the guests take photos of themselves and have them put the photos into a guestbook that they can sign. Finish the night off with a fireworks display. At the reception, place lanterns in the center of the tables surrounded by moss. Scatter river pebbles on the tables along with votive candles. For place cards, find larger river pebbles, and paint your guests names on them along with their table number. Place them on a table at the front of the reception, and decorate the table with moss, votive candles and a water display. Find invitations and thank you cards that fit in with the theme. Sunflowers are a great summer wedding idea for a late summer wedding. Visit Sunflower Wedding Theme for more ideas. Butterflies are a true sign of summer, so why not use them as your wedding theme? 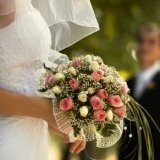 Visit Butterfly Wedding Themes for hints and tips.